The Oregon Trail began in Missouri and ended in Oregon City, Oregon. It was the route taken by about 400,000 settlers from the 1830s to about 1869. 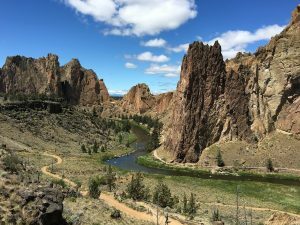 Oregon still has a lot to offer travelers but thankfully, we do not have to go on foot or horseback. 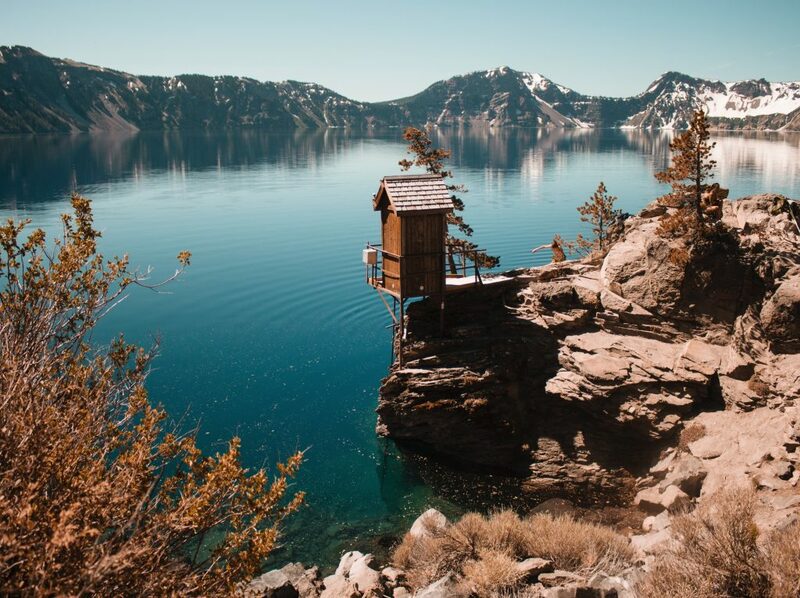 Oregon’s only national park, Crater Lake National Park, is located in southern Oregon. Crater Lake is about 7700 years old and was formed when Mount Mazama, a volcano, was destroyed. The caldera of the volcano formed Crater Lake. Not only are its waters the deepest but some of the purest in the world. This is due to the fact that it has no inlets or tributaries and thus has no pollutants in the water. If you are going to visit the National Park be sure to call ahead first. The roads may be closed anytime during the year due to weather but definitely between November and July. You can take a bike ride or hike around the lake. The park offers trolley rides for those who want to view the scenery without watching the road. Boat rides are available. Fishing for the trout and kokanee salmon is encouraged in the park. No fishing license is required but you must clean your fish outside the park. The park website offers links o several webcams in the park. A favorite is the webcam of Crater Lake. Just be aware that about half the time, the view is obscured by snow and clouds. Crater Lake Bed and Breakfast is close to the lake. It has wonderful views and you may decide to say for more than a day. Every geologist is aware of the painted hills. They are located northwest of Mitchell, Oregon in the John Day Fossil Beds National Monument. You can see the varying geological eras of ancient times in the landscape. The area was once an ancient river floodplain and the floodplain deposits are apparent. The appearance is of twisting waves of red, gold and black. Pictures do not do the sight justice. 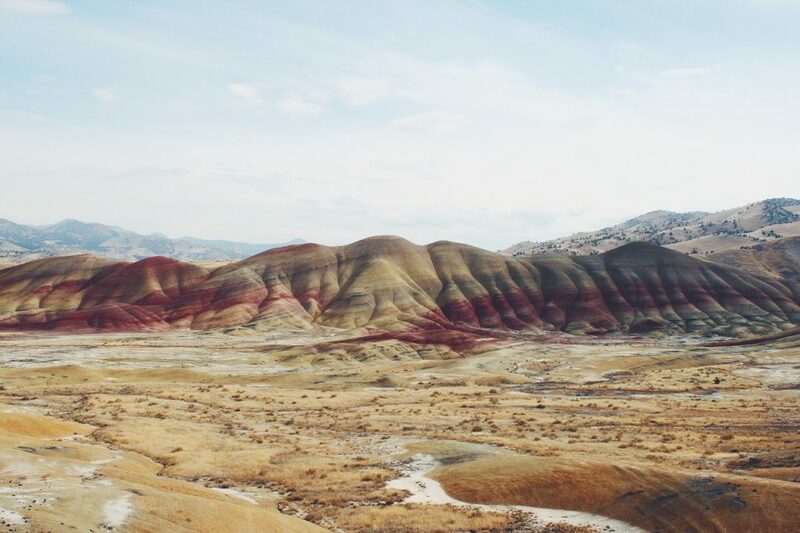 The sight is worth the drive to the painted hills. Many hikes are available for those who want to immerse themselves in the hills. The hills appear painted and the colorful layers of the hills will amaze you. In addition, there is an abundance of fossil remains in the area. A palaeontologist’s dream. Smith Rock State Park is located in central Oregon. Its sheer cliffs draw Rock climbers from all over the world. There you can find climbers from all levels, from beginners to the very expert climbers. The park is known for all sorts of sports climbing, from traditional to bouldering. The Wallowas is simply a mountain range. Located in northeastern Oregon the mountains are magnificent. The name Wallowas comes from Wallowa County, where it begins or perhaps ends. The Wallowa River flows thru the mountains. The name itself is from the Nez Perce Indians and means winding water. There was a Wallowa band of Lower Nez Pierce Indians as well. The mountain range was once inhabited by gold mining settlements. Today you can visit the ghost towns of these old settlements. You can and should bring the whole family. Cabins and camping and mini-golf abound around Wallowa Lake. Towns like Joseph and Enterprise offer art galleries, shopping, food, and drink, including handcrafted beer, craft distilleries, and chocolatiers. The Snake River winds its way thru the mountains and the canyons it has formed are deeper than the ones at the grand canyon. And then there’s the land, carved by the Oregon Trail and hardly changed since pioneers crossed by wagon. It’s bordered by the Snake River, working ranches, the remote Eagle Cap Wilderness and the wide open spaces that Eastern Oregon is known for. 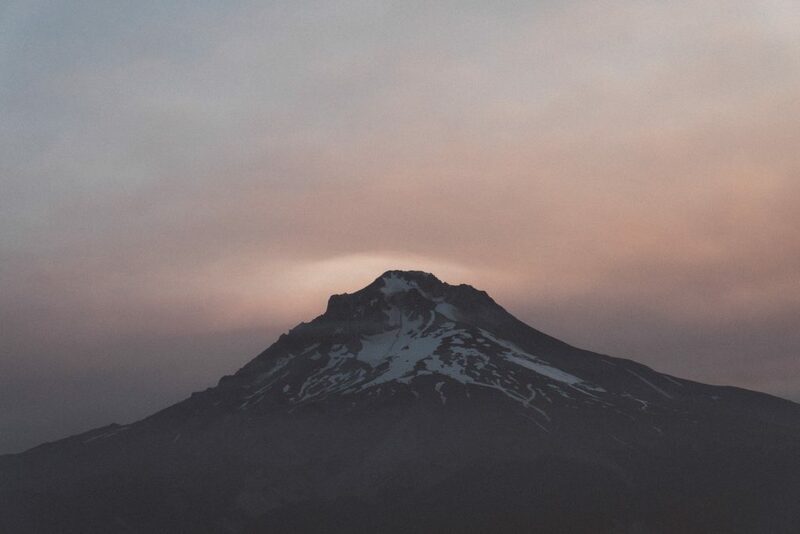 Mt Hood encompasses an 11,240-foot volcano. Although it does emit steam from its crater and has had five major eruptions in the past two centuries, it is active but not deeded a threat for an imminent eruption, The last major eruption was in 1781. Mt. Hood National Forest has eight nationally designated wilderness areas, totaling 311,448 acres. There are several popular destinations including Timberline Lodge, where the Pacific Crest Trail and the round-the-mountain Timberline Trail connect. However, due to snowy conditions, the trails may be buried from about late October to early July. Lower trails on the flanks of the volcano may be open. Those trails lead to waterfalls, reflecting lakes and rainforests. It is advisable to check the weather prior to planning any hiking in the area. You should spend 4 hours on a train excursion from Mt. Hood. It is worth the time. The area is designated as a National Scenic Area encompassing 292,500 acres It is composed of waterfall, wildflowers, cliffs, lakes, streams, and rivers. National Scenic Area is not a wilderness or park, but a 292,500-acre patchwork of public and private lands managed by the USDA Forest Service and its partner, the Columbia River Gorge Commission. 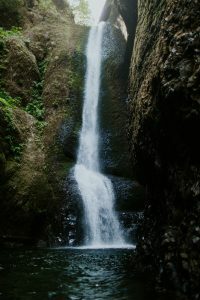 With stunning waterfalls, fields of wildflowers, basalt cliffs, lakes, streams and rivers, the Columbia Gorge Scenic Area is a magical, awe-inspiring place to visit in the summer or any time of the year. This is not a beach but a coast. No, you do not need your bathing suit as no one is tanning on the coast. It is awe-inspiring to see nature at its finest. There are breaks in the coastline where surfers congregate. Kayaking is a pastime that you can enjoy. Whale watching is a popular activity a well as searching for agates. The Oregon coastline has much to offer all who wander by. Looking for a romantic getaway? 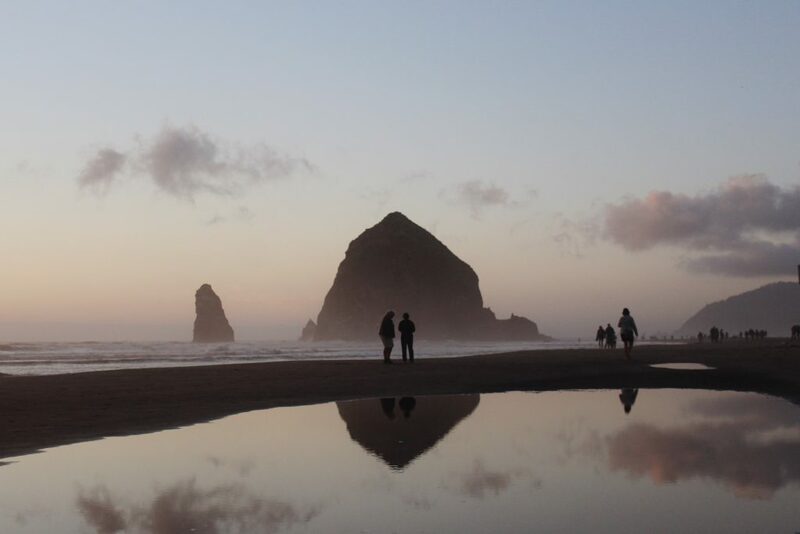 Cannon Beach may be what you are looking for. Watch as the artists paint the glorious landscape. Go birdwatching, play in the tidal pools, or just enjoy watching the surfers. The wildlife is amazing and the pace is quiet. Cannon Beach on the Oregon coast is a great place to spend a weekend or two. South of the coastal city of Florence begins the dune landscape of Oregon Dunes National Recreation Area. It stretches along the Pacific Coast for about 40 miles before reaching Coos Bay. But in between the beaches, wind-shaped sand dunes and pocket forests offer an unusual scenic area as well as the sandboarding destination of Sand Master Park. Do not miss the Heceta Head Lighthouse, one of many historic and picturesque lighthouses perched along the Oregon coast. Viator has a great tour of the Oregon coast. It begins and ends in Portland. You should check it out! There are many other sights to see in Oregon and the following are a few of them. 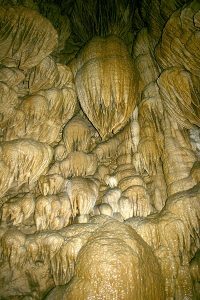 Located in Cave Junction, OR, Oregon Caves National Monument and Preserve is fascinating. The caves formed from rainwater dissolving the marble under the earth. Thus the “Marble Halls of Oregon” was formed. The Preserve is open March thru November but inclement weather can cause the roads to be closed. There is no fee to enter the preserve and one of the best parts of the Preserve is the cave tour. Reservations for the tour are accepted and since the tours sell out quickly, plan your visit before arriving. Rangers lead the tours thru the marble corridors and discuss the caves’ natural and cultural history. There are bats in the caves but they usually do not hibernate or bear their young in these caves. Austin, Texas has the largest colony of Mexican free-tailed bats in an urban setting. Watching the flight of bats in Austin is exhilarating. Out ‘n’ About Treehouse Treesort in Cave Junction, Oregon. This is an amazing place to stay. All are treehouses and all are different. It is a true bed and breakfast in the trees. The resort sits on 36 acres. You are welcome to try the zip line, horseback rides, river rafting, hiking, arts and crafts, music and events, conferences and workshops. They have something for everyone. The Tree Resort is open year round but be sure to call ahead. The Willamette Heritage Center is in Salem, Oregon. The site houses old structures that were originally built in the 1800s. Many were moved to the present site in the 1960s. The site occupies 5 acres near downtown Salem. Visit each house and then stop in the library and peruse the archives. You can take lessons and learn how to weave or how to lace. It is an old art that we need to keep alive. In May of each year, they have their annual Sheep to Shawl Festival. The exhibits and demonstrations provide insight into the process of wool fiber processing from shearing the sheep to producing final products for us to use. To top off the fun, entertainment and food are provided. This art museum is the oldest on the west coast, founded in 1892. It has been located at the corner of SW Park Avenue and Jefferson Street in Portland since 1932. The exhibits in the museum depict a visual narrative of the Northwest. The museum’s collections include American art, a well as Asian and European Art. In addition to Modern and Contemporary Art, the collection includes Native American Art and, of course, Northwestern Art. With 112,000 square feet of galleries, there is something for everyone. While you are in Portland, consider taking a sightseeing tour. You can not go wrong! The Gardens have been a success. It is considered to be the most beautiful and authentic Japanese garden in the world outside of Japan. The 5.5 acres are a place of beauty and peace. It is a tranquil oasis in our fast-paced world. This windowless museum in Eugene is designed to protect its art treasures. The wide-reaching collection features primarily Asian artworks, along with pieces from America and Europe. Opened in 1933, the museum is located on the University of Oregon campus, where other attractions include the Museum of Natural and Cultural History and a historic track at Hayward Field. The hours are: Tuesdays thru Sundays from 11 am to 5 pm, and Wednesdays until 8 pm. A nominal admission is charged. There is a lot to do and see in the great state of Oregon. It has diverse landscapes and lots of water and is known as one of the most geologically unique and botanically diverse areas in the United States. To learn more about other destinations in and outside the United States visit Guide for Seniors. Mantra Sleep Eye Mask: This eye mask is the only adjustable maks we know of. It completely blocks out all exterior light making it much easier to fall asleep. It is indeed more expensive than other sleep masks but your sleep is worth the comfort. Compression Socks from Amazon: Try these compression socks the next time you are traveling by car or by plane, or just walking. You will be amazed at how great your legs will feel! 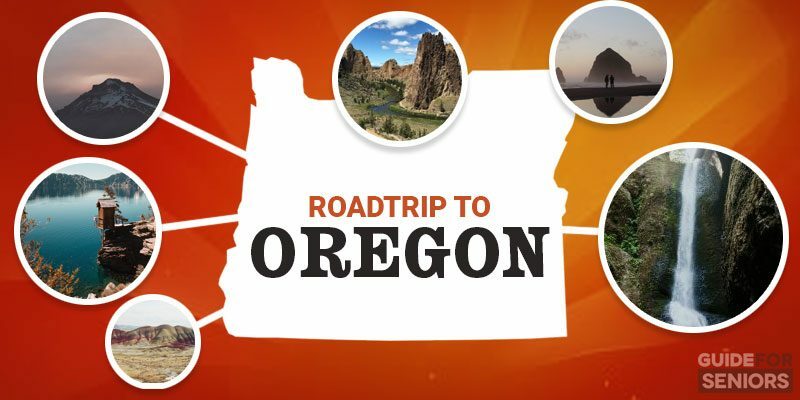 Travel Oregon: learn more about our great state of Oregon. Travel Portland: Portland is not to be forgotten in Oregon. Best Beaches in Oregon: This blog article will inform you about the best beaches in Oregon. The beauty is breathtaking although the water may be a bit chilly.